Garey 12, Chaffey 6 — Tien Nguyen and Amerly Keo swept in singles to lead the Vikings (1-1) to their first win of the season. Bishop Amat football not only graduated one of the best senior classes that advanced to back-to-back Pac-5 Division semifinals, but four seniors they had counted on to keep the train moving are no longer at the school. Here are four former Lancers who started their senior years someplace else, and how they did in Week 0. Quarterback Jack Graham, Citrus Hill: Completed eight passes for 60 yards and four carries for 14 yards. Didn’t play second half in 31-0 win. Wide Receiver Tyler Sweet, Upland. Finished with five receptions for team-leading 133 yards in 41-22 loss to Mountain Pointe. Wide Receiver Noah Rigney, Chino Hills. The slot receiver had eight receptions for 63 yards in 19-7 win. Defensive Back Blake Jenkins, Corona Centennial. Deflected numerous passes and played a bunch for one of the best teams in the country. Speaking of Amat, came across its 2016 hype video. Great stuff. Enjoyed the part where they showed Aram, Steve and I on PrepXtra with a “You (meaning Amat) against Can’t (meaning us). All in good fun. El Monte 3, Nogales 0 — Giselle Alarcon had 11 kills, Jackie Lam added seven kills and three aces, Stephanie Garcia had five aces and Ariana Gutierrez recorded 12 digs for the Lions (4-1) in a 25-23, 25-16, 25-18 nonleague match. Gladstone 3, Palm springs 1 — Celina Vargas had 12 kills, Lissette Ramos had 11 kills and Selena Jara had five aces for the Gladiators (6-1) in a 25-18, 20-25, 25-18, 25-21 nonleague win. San Dimas 11, Webb 8 — Goalie Joe Doonan recorded eight saves and Robbie Simpson scored seven goals for the Saints in their first nonleague win of the season. San Dimas’s Jared Caldarone, Henry Landers and Brady Boyde each scored a goal. Gladstone 11, Charter Oak 7 — Marina Chow and Josephine Marquez swept in singles and the doubles teams of Anahi Sandoval and Erika Rios and Julia Escobar and Melina Ramos won two for the Gladiators in their first win of the season. Glendora 1, Newport Harbor 1 — Paige LeHine scored a goal with an assist from Ellie Morrison and goalie Meagan Olson had 22 saves for the Tartans in a nonleague tie. Two-Minute Drill: Damien and Glendora were very impressive in Week 0, setting up Friday’s game of the week between the Tribune’s fourth-ranked Damien and fifth-ranked Glendora. They play Friday at Citrus College at 7 p.m.
Two-Minute Drill: La Mirada had the big win over Division 1 Orange Lutheran last week, which follows their CIF section and state titles from last year. Now it gets St. John Bosco, ranked top ten in the country by MaxPreps and we’ve got one question … Can they stay within 40? Football Notes: Northview QB Steven Comstock OK; will South Hills face La Canada RB? Northview standout quarterback Steven Comstock gave his team quite a scare in the first half of last week’s loss to Charter Oak after suffering a knee injury and leaving the game in the first half.Comstock said he hyper-extended his right knee while scrambling and trying to avoid a Charter Oak defender inside the Chargers’ 10-yard line. He left the game but later returned with a noticeable limp. After tweeting that night that he was in serious pain, Comstock said Monday that the knee is back to 100 percent and he won’t be limited in Thursday’s game against Rosemead. Arroyo coach Jim Singister keeps tie with Covina in perspective. There would be no other coach in the Valley more frustrated than Arroyo’s Jim Singiser, whose team committed seven turnovers, including two inside the Covina 2-yard line in the closing minutes, in a 17-17 tie to the Colts on Saturday night. But Singiser is preferring to view the positives as his team prepares for Friday’s game against Temple City. However, Singiser said the end of Monday’s practice would look like cross country practice due to all the mistakes. Will South Hills face La Canada’s bigtime RB Friday? La Canada High School football coach Ryan Zerbel is hopeful that an independent investigator looking into the transfer of running back Drake Beasley will have situation concluded this week and the CIF Southern Section will clear his star ball carrier in time for this Friday’s game against South Hills. La Canada hired the investigator in response to allegations from Loyola, Beasley’s previous school, that his transfer was invalid due to undue influence. Loyola presented its case to CIF-SS and now La Canada is set to respond. 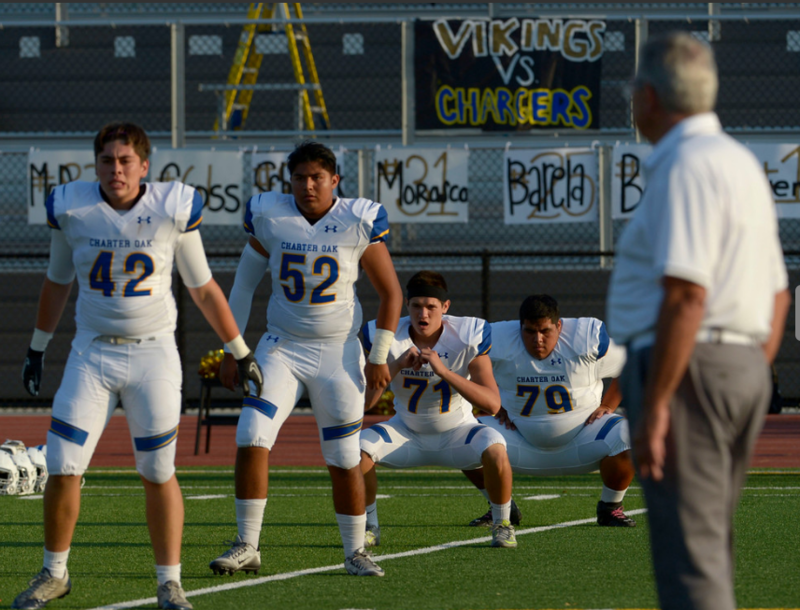 Monday’s PrepXtra Rewind: What does La Mirada’s big win and Bishop Amat’s crushing loss mean? 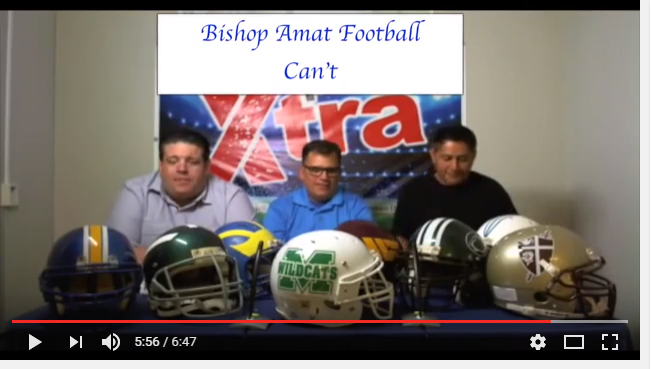 Aram Tolegian and Fred Robledo will discuss the big stories from Friday’s games in 15 minutes of fun on Monday’s Prep Xtra Rewind. This week we discuss what La Mirada’s big win over Orange Lutheran and Bishop Amat’s big loss to Mater Dei mean to the programs. One of the best highlight compilations is from SoCal Prep Legends host Tarak Fattal, who recaps the best of the best from the Southland on Flashback Monday. Watch Charter Oak-Northview highlights at the 4:00 minute mark and look for plays that make the SCPL Top 10 and are eligible for plays of the week. The Game: Aram Tolegian and I will go head to head throughout the football season picking winners. If we don’t pick 80 percent winners, we’re not doing our job. Follow along. My thoughts: Wouldn’t say Aram crushed it as much as I tanked it. Can’t remember the lat time I lost 15 games in one week. I’m starting way behind, and there were too many losses to call out, so on to Week 1. Best game locally, Glendora vs. Damien at Citrus College. We’ll have a two-minute drill on this Tuesday, but gotta believe Damien sneaks this one out. Glendora played well last week, but Damien’s win over Chino more impressive. Charter Oak gets a real tough opponent in Colony, who smacked West Covina last week. Might be going out on a limb taking Charter Oak, but I think they’re ready to prove they can battle and get a win against a tougher opponent than Northview. Bishop Amat will likely drop to 0-2 against Servite, not enough offense and defense gives up too many points.